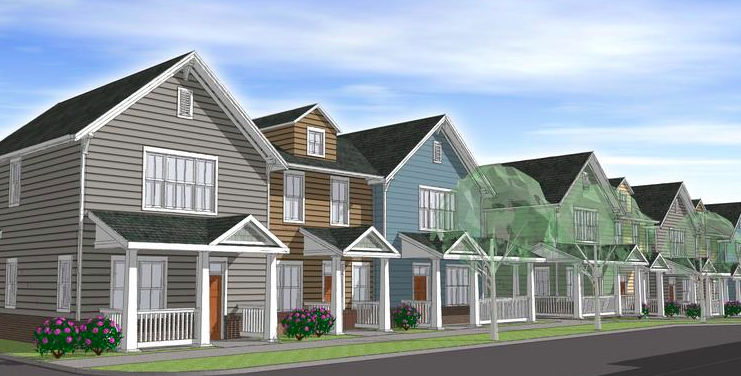 Belmont is about to be home to a beautiful new affordable multi-family development. Laurel Street residential, in partnership with St. Paul Baptist Church, just broke ground on the 112-unit community that will be located at 1322 Allen Street. The community will include a 60-unit senior housing building, 29 townhouse-style units and a 23-unit garden style apartment building. This rental community is designated for seniors as well as families that earn 60% or less of the region’s median income. The project is slated to be finished in late 2017. Creating stable housing options for a historic community like Belmont is crucial to the successful future of the town. Affordable housing for current residents with fixed or limited incomes provides them with the opportunity to stay in the community in which they live. Community amenities will include outdoor seating areas, a playground, a computer center, a community room, a fitness center and also a covered picnic area. St. Paul Baptist Church, which plays a major role in the development of this project, aims to expand affordable housing in the Belmont neighborhood. While it is primarily their vision behind the project, the city of Charlotte also plays an instrumental role in helping the plan come to fruition. The new development will also be closely located near a future light rail stop, making accessible transportation options available for people of all incomes. For more information and details on this affordable housing project in Belmont, read the full article at bizjournals.com.